WILLIAM JAY(jj4/5) was John and Sally Jay’s youngest son. He was born thirteen years after his brother Peter. Peter was born in 1776, the year of the Declaration of Independence. William was born in 1789, the year of the Ratification of the Constitution and the induction of George Washington as President of the United States! William was educated in Albany, while his father was serving as Governor of the State. 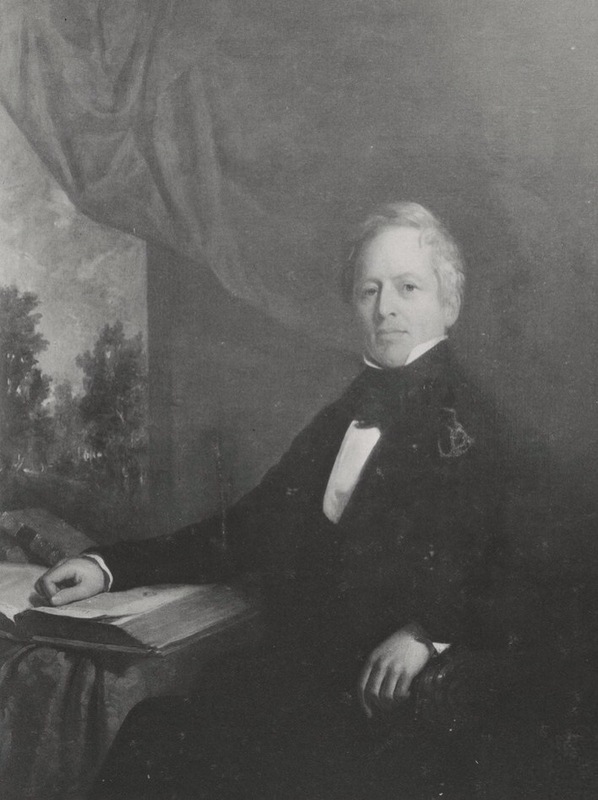 He broke family tradition and went to Yale in 1808, and then returned to Albany to study law. Trouble with his vision prevented him from a full time legal career and he returned back to care for his father in Bedford. In 1818 he was appointed a Westchester County judge by DeWitt Clinton and served with honor as judge until 1843. In 1812 he married Augusta McVickar, described as a woman in whom “were blended all the Christian virtues”. They lived in the Katonah house where they raised their six living children (two children died in infancy). William Jay became noted for his anti-slavery opinions and his strong Christianity. He became vice president and co founder of the American Bible Society. Hannah Augusta McVICKER was born on November 11, 1790, in New York, New York, the child of John and Anna. She married WILLIAM JAY on September 4, 1812. They had six children in 20 years. She died in 1851 in Philadelphia, Pennsylvania, at the age of 61. ANNA JAY(wm5/1)was the oldest child born to William and Augusta Jay. She married the Rev. Lewis Penn Witherspoon Balch, the rector of St. Bartholomews Church in New York. They had five children, of which three lived to adulthood. Anna Jay died after the birth of her youngest child. The Rev. Balch remarried Emily Wiggins. Anna Jay Balch was buried along with her second son who died in infancy in the Jay Cemetery. Rev Lewis P W Balch attended three years at West Point Military Academy, and one year at Princeton College, where he graduated in 1834. He entered General Theological Seminary in New York. While still Deacon he was called to St Bartholomew’s Church in New York where he remained from 1837 to 1850 and cleared the church of debt. He was obliged to leave New York for his health, and for five years he was rector of parishes of Chester and West Chester, Pennsylvania. He held several other posts from 1855 to 1866. During this time he was secretary of the House of Bishops. From 1866 to 1871 he was canon of the Cathedral of Montreal. In 1874 he was appointed rector of Grace Church, Detroit, where he stayed until his death some six months later. Dr Balch was a man of most charming manners. As a preacher he was at once impressive and powerful, and at times eloquent. His sermon at Newport on the death of Lincoln produced an effect on those who heard it which is still remembered. He had an extraordinary power of raising money for churches in debt. He secured the discharge of indebtedness of eleven churches during the forty years of his ministry. MARIA BANYER JAY(wm5/2)married John Butterworth and lived in England. They had two children, the youngest, Eliza became a Roman Catholic nun in England. The oldest daughter, Augusta, married William Smith. MARIA BANYAR JAY was born on April 28, 1815.. She died on November 17, 1851, at the age of 36, after the birth of her second daughter. JOHN JAY, II lawyer, born in New York city, June 23, 1817, died in New York city, May 5, 1894. His father was William Jay, lawyer, judge and author, and his grandfather, John Jay, first Chief Justice of the United States. The subject of this memoir graduated from Columbia College in 1836, and read law in the office of Daniel Lord, jr.
SARAH LOUISA JAY(wm5/4) married Alexander Bruen in 1848. They had four children one of whom, Augusta(Q1) died in childhood. Their second daughter Alexandra married George Elmore Ide, Rear Admiral in the United States Navy and both were buried in the Jay Cemetery. Their third child and oldest son Alexander Jay Bruen(wm6/16) studied law. He married Constance Fiedler in 1907. They had five children, four of whom grew to adulthood. Eliza Jay was born in 1823 as the fifth daughter of William and Hannah. She married Henry Edward Pellew and moved to London. They had three children as noted and she died in 1869 after the birth of her third child, who also died the next year. RoyalBio: HENRY EDWARD, 6th Viscount Exmouth, b. 26 Apr. 1828. Only son of the Hon Very Rev. George Pellew. He was. Educated at Eton, then Trinity College at Cambridge where he received a B.A., (Bachelor of Arts) 1850; M.A., (Master of Arts) 1853. Rowing ‘blue,’ 1849. Went to America, 1873, where he was naturalized. Organized, with Theodore Roosevelt, Bureau of Charities in New York. Married 1stly, 5 Oct. 1858, ELIZA JAY, daughter of the Hon. Judge William Jay, of New York, and granddaughter of John Jay. They had two children, the oldest William, a writer of Jane Austin novels and the life of John Jay. Augusta, (Fusty) Jay, was the youngest child. When AUGUSTA (Fusty) JAY was born on May 29, 1833, in New York, her father, WILLIAM, was 43 and her mother, Hannah, was 42. She married Henry Edward PELLEW after her sister’s death, on May 14, 1873. They had one child during their marriage. She died on January 24, 1917, at the age of 83. This entry was posted in Jay Family History and tagged Balch, Bruen, Jay F amily, jay. geneaology, William Jay, William Jay Family on April 15, 2016 by jsdubois28.